It was a sleepless night for many in Saint-Henri. Work on the demolition of the Turcot interchange has been ongoing, but overnight, residents say that the noise levels skyrocketed. It was a rough night for Phil Boudreau and his neighbours on St. Jacques Street. 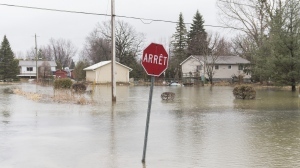 From Saturday to Sunday, work continued on the Turcot, and residents living nearby took to social media – Twitter and Facebok – to vent their frustrations. Eileen Holowka said it’s the loudest the construction has ever been. “It’s just a constant banging noise with pauses in the middle, just enough to drive you absolutely crazy,” she said. “Every time you’ve got the rhythm down, it takes a nice pause and starts up again. Holowka, while acknowledging that a project of this scale will no doubt be noisy, said that this weekend’s activities crossed a line. “The levels we hit this last weekend are… ridiculous,” Holowka said. A nearby station that measures the sound output in the area was largely “in the red” – showing noise levels that were well above the threshold that’s permitted between 7 p.m. on Saturday and 6 a.m. on Sunday morning. 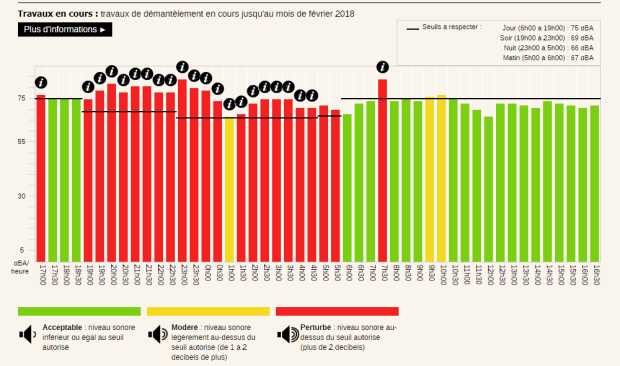 Real-time noise data recorded at Desnoyers and St. Jacques showed levels higher than the "acceptable" noise threshold for 11 consecutive hours. At some points, it hit levels between 80 and 85 decibels. 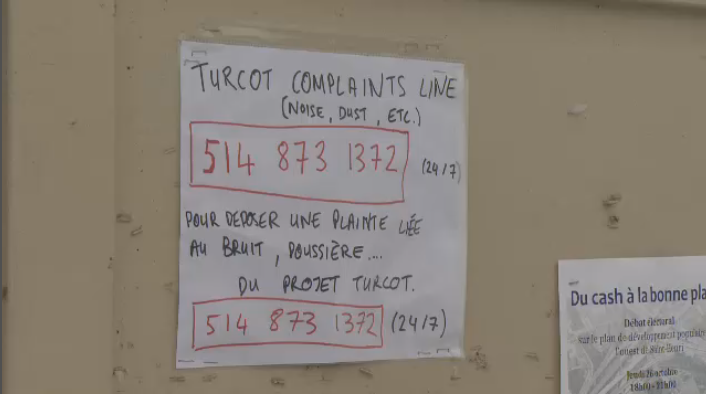 On the other side of the city, in Westmount, residents have already appealed to Quebec’s Superior Court to issue a stop work order for the new Turcot, asserting that the noise is already above maximum safe levels and will only get worse with time. But in Saint-Henri, an area that residents acknowledge as “lower income,” there is, so far, little hope that conditions will improve. “The fact is, no one really complains here because they know not much will be done,” explained Mihran Abrahamian, who lives on Cazelais St. He’s trying to encourage residents to speak up. CTV Montreal reached out to the MNA for Saint-Henri, Dominique Anglade, but she declined comment.